A lot of high profile iOS games have been flooding the market recently, and while we'd love to review them all, many of them slip through the cracks. We'd also love to give each game its own dedicated review, but the nature of mobile gaming doesn't always make that feasible. So here are three reviews for your money! First up we have the latest portable installment in GameLoft's Call of Duty clone, Modern Combat 2: Black Pegasus. Then we have the Japanese-but-not-actually-Japanese RPG Ash. Finally, we have a Christmas spin-off of Super Mega Worm, Super Mega Worm vs. Santa. 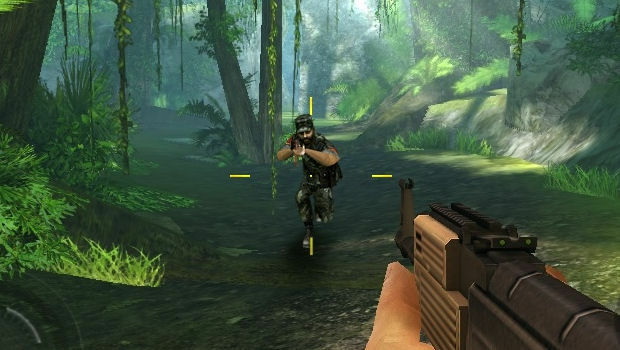 Modern Combat: Operation Sandstorm is considered one of the best shooters on the iPhone, despite also being one of the most derivative games in town. As per GameLoft's modus operandi, the Modern Combat series is a shameless "homage" to a console series, which in this case is quite clearly Infinity Ward's Modern Warfare. GameLoft's always been able to get away with its borderline plagiarism, however, because the games tend to be good, and provide unrivaled console experiences on iOS devices. Unfortunately, something went wrong somewhere between Sandstorm and Black Pegasus. Modern Combat 2 isn't a terrible game, to be fair. In fact, it's tightly designed, surprisingly varied and packs in more action than the last game. For some reason, however, GameLoft decided we needed a big fire button that's placed too far toward the center of the screen. Coming from a developer that is used to creating competent first-person iPhone games, it's surprising to see such a blatant issue. The button placement for firing affects the entire game, as trying to look around nearly always means you accidentally fire your weapon. The same is true for the grenade button, which is placed in such a way that you'll swipe across it and change grenade type when all you wanted to do with turn around and shoot the terrorists who are on your right. Black Pegasus also tends to be rather glitchy. During one level, I loaded a checkpoint to find I was trapped in an elevator and the door wouldn't open. I had to restart the entire level and fight my way back to the elevator, where it finally decided to open. Add to this the fact that enemies can see and shoot you through walls, and you've not got a great game on your hands. When it works, Black Pegasus is a decent experience, but it's not a patch on the first game. Controls are poorly placed and the whole game feels sloppy and rushed, which is abysmal behavior from what is usually one of the best iOS developers in the business. Oh, and nobody's playing the multiplayer. There are better games out there for far cheaper. 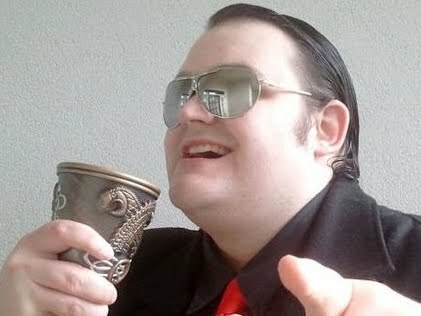 Get the original Modern Combat or N.O.V.A, which cost less and provide far more entertainment with far less aggravation. It's surprising that traditional turn-based roleplaying games aren't so prolific on iDevices, since the slower, methodical pace is well-suited to touch screen controls. SRRN games is doing its bit for the genre, however, with Ash. From the pixel art style to the rather gorgeous music, Ash is practically a JRPG without the "Japanese" bit. Ash tells the tale of a pair of mercenaries who are on the run from the obligatory evil empire. Of course, things don't stay that way forever, especially when rugged old boy Nicholas gets his arm turned black by a mutated bandit. While Ash's story isn't anything that will be held up as an example of stunning interactive narrative, it is decently written, with a few instances of humor that actually manage to amuse. As far as the gameplay goes, Ash is an unapologetically old school experience, with a turn-based combat system and random encounters. The viewpoint has an echo of Dragon Quest, as does the game's focus on grinding. While the retro nods are appreciated, SRRN does appear to have gone a little bit too far in its attempts to chase tradition. Even if we ignore the sheer volume of random encounters, the battles themselves are rather lengthy, drawn-out affairs. For a start, enemies dodge or "shrug off" attacks far too often, which means that even a monster with a handful of hit points can drag out a battle for longer than it should take. Add to that the randomized weapon damage which can range from powerful to ludicrously weak, and every minor fight feels like a slog, with rewards that usually aren't worth it. The game's difficulty is also all over the place. Whenever you enter a new area, the monsters are easily more powerful than your party. However, as soon as you get to the next town and buy the latest equipment, the monsters instantly becomes pussycats who are unable to so much as threaten you. There seems to be no balance at all, and thus the focus of the game is squarely on grinding in order to scrap together pitiful amounts of gold before being able to afford the new weapons and armor. There are plenty of gamers who are into that, but it feels less satisfying in this game since the difference between having the right gear and not having the right gear is so absurdly dramatic that you feel you're just buying your way to success. One other major issue is the total lack of a map. The overworld is rather large and sprawling, and wandering into the wrong area can get you assaulted by powerful opponents. Unfortunately, Ash only gives you vague hints about where to go and there's no map system, which means getting lost is all too frequent. The game has two control systems, one of which sees you swiping the screen to move, and another that uses a virtual D-Pad. Of the two, the D-Pad is the best option, but even then, it's quite small and demands too much precision to be used efficiently. Another strange issue is the jarring, conflicting art style the game has. 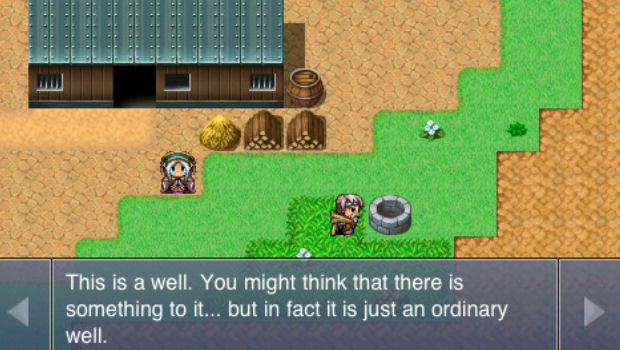 The overworld sections are sprite-based, while the NPCs are all in a very simple anime style. Meanwhile, the monsters are highly detailed, static artworks. Having two different art styles for non-battle and battle sequences is fine, but the fact that three have been used gives the game a rather unfocused look. As already discussed, this is not a problem that the audio suffers from, since Ash has a really wonderful soundtrack that serves as the game's highpoint. All of this sounds quite negative, and it's true that Ash has a lot of issues, but for the patient and forgiving there is a pretty good little RPG under there. With its charming dialog and competent battle system, this is a title that grind-lovers will like. It's just a shame that the grinding doesn't feel as rewarding as it should and that so much of the title feels cumbersome and archaic. The game's various battle systems are well made and there are no major technical problems. It's just a case of the game being imbalanced in all the wrong places and lacking in player direction. 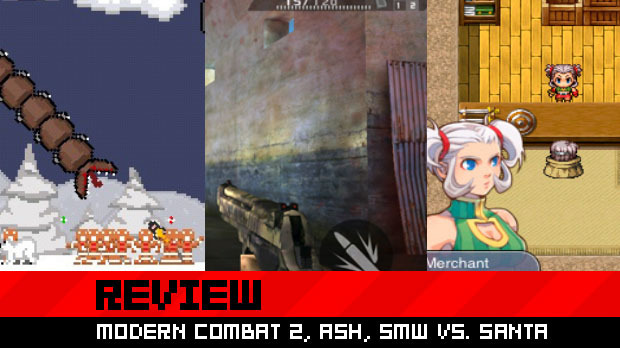 If you are a huge RPG fan and need something to play on the go, there are frankly better titles out there, but if you've played all those, Ash will sort you out. Get it while it's $2.99 though, as I don't think that the game, at this current moment, deserves much more. If you've played Super Mega Worm before, you know what this game is about. That said, if you've played Super Mega Worm before, you don't need this. It's basically the original game with a Christmas skin, but that doesn't mean it's bad. In fact, Super Mega Worm is a pretty good game. Now you have the choice of a festive version. Super Mega Worm is basically Tremors, except everything looks 8-bit and you get to play as the subterranean, people-munching worm. The aim is to tunnel underneath the pitiful humans and their livestock, before popping out of the ground to eat them. The game is simple, but sowing carnage and terror as a gigantic arthropod is entertainingly cathartic. As the game progresses, the humans start to fight back, but you gain access to new powers, such as the ability to spit green chunks at enemies and destroy them. Super Mega Worm vs. Santa brings all that fun to the North Pole, where penguins and elves become your prey. It's more amusing to decimate the forces of Christmas than it is rednecks and soldiers, so this festive edition to the game definitely scores brownie points for that. However, one wonders why this is its own game, and not just an updated skin for the original game. There's no reason for this to exist as its own title when the changes are almost entirely visual. There are a few minor changes outside of the visuals, such as an "Ice Spit" ability, and some different enemy behavior, but they're still nothing that couldn't have been thrown into a free update. 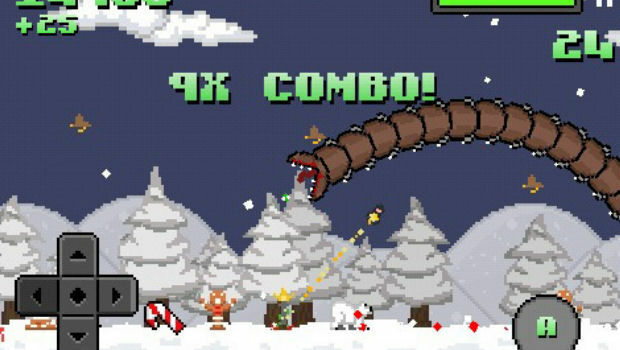 Taken as an entity on its own, Super Mega Worm vs. Santa is a good game and if you've never played Super Mega Worm before, this comes recommended and I'd probably put it above the first title just because it's slightly more sadistic in its scenario. If you have the original title, however, then don't bother. You only need one of these games, not both.